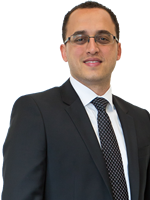 Isaac Radnia is an attorney at Kamran Yadidi who focuses his practice on personal injury law; namely, motor vehicle accidents, slip-and-fall accidents, and dog bites. Since joining the firm in 2007, Mr. Radnia has been successful in helping Kamran Yadidi’s team of attorneys recover millions of dollars for their clients and he personally has negotiated millions of dollars in settlements and judgments. Isaac is relentless in his goal of obtaining the best settlements and verdicts for his clients. He never holds back, and isn’t afraid to be firm in his convictions. Isaac leaves no stone unturned, and investigates every option possible when working for his clients. Isaac Radnia received his Juris Doctorate degree with high honors from the University Of West Los Angeles School Of Law and his Bachelor of Arts degree in Political Science from California State University (Dean’s List). Prior to becoming an associate, Isaac was a clerk for Kamran Yadidi for seven years (full and part time during college and law school). He is a member of the California Bar Association and the Consumer Attorneys Association of Los Angeles.